British astronaut Tim Peake talked to ten students from the City of Norwich School in England from the International Space Station thanks to an Amateur Radio link up. He talked about what life is like in space, what happens when you bleed in a microgravity environment, his favourite view of Earth from space, and the experiments he is currently involved in. Major Peake and the Norwich students were linked up by the UK Border Agency and the Amateur Radio station on the ISS’ team. Tim Hare, a fifteen-year-old amateur radio enthusiast, established a connection with Major Peake’s craft 250 miles from the Earth’s surface using a special call sign. Within a few seconds of linking everybody up, the British astronaut appeared on the screen, with his voice coming through the speakers. The ten students made the best of the short period allotted to them to ask questions, and there were some interesting ones. When asked which were his favourite regions on Earth to look down at from space, Major Peake, from Chichester in West Sussex, said they were Africa and north Canada. He also commented on his sleep quality and patterns, and said that since his arrival on ISS he had not been dreaming much. 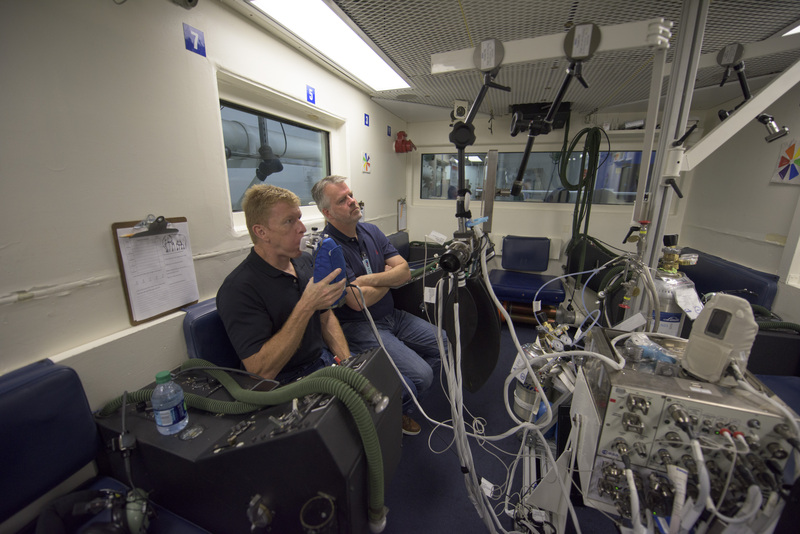 On Friday, Major Peake and fellow crew member NASA’s Colonel Tim Kopra both took part in an experiment which will help scientists determine what happens to space travellers’ lungs when they are on the Moon or other low-pressure environments. The two men were placed in a sealed off airlock in the space station’s Quest Module, and a low-pressure environment – 517 mmHg (millimeters of mercury) – was simulated. The standard atmosphere pressure on Earth at sea level is 760 mmHg. While in the airlock, researchers were particularly interested in the crew members’ airway inflammation. For human beings, living in space is not easy, Major Peake explained. Over millions of years, humans have evolved to live with gravity – take it away and we do adapt and appear to cope amazingly well. Even so, astronauts need to monitor virtually every aspect of their health up there. “Luckily I have a flight surgeon at the European Astronaut Centre and a team of biomedical engineers who watch out for me daily, but space medicine is still a very new discipline,” Major Peake explained. Astronauts’ lungs can easily become irritated or inflamed because of dust particle inhalation – fortunately, so far Major Peake says he has not had any problems. On Earth dust settles on the ground because of gravity, but in the ISS’ weightless environment it floats about. That is why the crew cleans ISS thoroughly every Saturday. On Earth, medical professionals would use a CT scan or X-ray to test whether somebody’s lungs are inflamed. This is not possible in space because there aren’t any scanning devices. Scientists involved in the Airway Monitoring experiments devised a simple nitric-oxide test which the two astronauts had to use to see whether it worked. For the vast majority of people, being able to breathe in and out all day is taken for granted. People with breathing difficulties, such as patients with asthma, are not so lucky. For millions of individuals with respiratory problems, this nitric-oxide test could offer a cheap and rapid way to diagnose lung problems everywhere – if it works in space, most likely it will work back on Earth.